Audacious is a fast, open source audio player. A decendant of XMMS, Audacious focuses on high audio quality and low system resource usage and it ships with numerous plugins for various purposes, such as effects, visualisation, desktop integration and more. 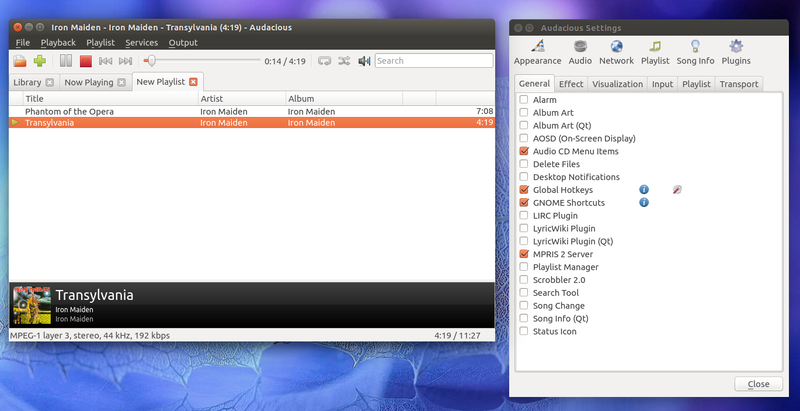 The player ships with a GTK and a Winamp 2.x-like interface and, with the latest version, a new Qt interface. Audacious 3.6 was released recently and with this version, the developers have decided to switch back to GTK2 by default. The Qt interface will also be used in a future Audacious port for Mac OS X. For the 3.6 release, the Audacious developers have provided a separate GTK3 tarball but this will probably be dropped in future releases. For this reason, the Audacious packages from the main WebUpd8 PPA are built with GTK2 (the Qt interface is also enabled in the PPA builds so you can launch either of them from the menu, but not both in the same time). Ubuntu 14.04, 14.10 and 15.04 / Linux Mint 17 and 17.1 (and derivatives) users can install the latest Audacious 3.6 by using the main WebUpd8 PPA. The PPA provides Audacious with the GTK2 and Qt interfaces! With this release, users who install Audacious from the main WebUpd8 PPA will find two Audacious entries in the menu/Dash: one called "Audacious" which can be used to launch Audacious with the GTK2 interface and another one called "Audacious Qt Interface" which is self explanatory. If you don't want to add the PPA or you're not using Ubuntu / Linux Mint, you can download the latest Audacious 3.6 source as well as Windows binaries from its website, .